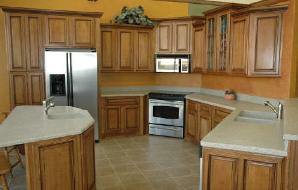 New kitchen cabinets (Figure A) are one of the largest investments that a homeowner can make. Yet very few people look after their kitchen cabinets in a proper manner. Kitchen cabinets are made in the same manner as furniture and the quality and construction levels mimic the materials and joinery. Where a homeowner may polish a new dining room set weekly, for some reason the same tender loving care is not applied to kitchen cabinets. When purchasing new kitchen cabinets it is important that you read and understand the manufacturer's instructions for care. The kitchen cabinet manufacture wants his products to look good, primarily because he wants you to sell his cabinets to your friends and relatives! Proper, on-going kitchen cabinet maintenance will protect your investment for many years to come. As with any piece of furniture their are many different kinds of materials used to create the finished product and each type of material requires a different level and kind of care. It is important to recognize that kitchen cabinets are installed in a very harsh environment, compared to most furniture within your home. Your kitchen cabinets will be exposed to steam, high heat, grease and other food splatters. Kitchen cabinet doors and drawers are opened and closed more often then any other piece of furniture, exposing them to a much higher level of wear and tear, not to mentions the grime that is passed from hands and fingers to these pieces of cabinetry. It is important to know what your kitchen cabinets are made from. If you do not know what the materials are, you cannot properly maintain and repair the kitchen cabinets. This is also important should you ever plan on refinishing the kitchen cabinetry. Many surface finishes are not compatible with other surface finishes and if you try to cover one with the other you may end up with blistering and pealing. Solid Wood - a number of woods are commonly used. Oak, maple and cherry (Figure 1) are the three most popular natural woods used in the construction of kitchen cabinets. However, it is not uncommon to find elm, and pine and in the very high end cabinets as well as walnut, and more exotic species. Wood Veneer - Wood veneer is used to cover such as MDF (Figure 2) and particleboard. It is less expensive than solid wood and is much more stable (doesn't warp). However, many of these materials expand when they get wet and do not return to their original size when dry. Paper - Paper is becoming more and more prevalent as a laminate material on engineered wood panels. It is inexpensive and with the new clear coatings that have been formulated they stand-up to wear and tear exceptionally well. It should be noted however that the appearance is a picture of hardwood and not hardwood! Melamine - Melamine is an engineered product that has been around for a number of years. It can be colored and created to imitate wood and is also available in solid and patterned colored sheets (Figure 3). It is bonded to a panel of MDF or other engineered product for strength. Vinyl - Vinyl wrapped over MDF is very popular in the UK. It is usually installed on finished cabinetry, (the cabinets are built of bare MDF and then wrapped in sheet vinyl in a color or wood grain). Vinyl is very easy to clean. In many cases kitchen cabinets will be made from a combination of materials. Hardwood doors, drawer fronts and frames, combined with veneered panel products for the sides, tops and shelving. This means that diverse care and maintenance techniques may be required on different parts of the cabinetry in order for it to continue to look good in years to come.